(Nanowerk News) By studying the origins of different isotope ratios among the elements that make up today’s smorgasbord of planets, moons, comets, asteroids, and interplanetary ice and dust, Mark Thiemens and his colleagues hope to learn how our solar system evolved. Thiemens, Dean of the Division of Physical Sciences at the University of California, San Diego, has worked on this problem for over three decades. 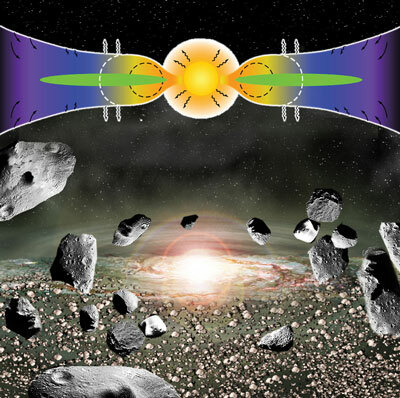 In recent years his team has found the Chemical Dynamics Beamline of the Advanced Light Source (ALS) at the U.S. Department of Energy’s Lawrence Berkeley National Laboratory (Berkeley Lab) to be an invaluable tool for examining how photochemistry determines the basic ingredients in the solar system recipe. The protosun evolved in a hot nebula of infalling gas and dust that formed an accretion disk (green) of surrounding matter. Visible and ultraviolet light poured from the sun, irradiating abundant clouds of carbon monoxide, hydrogen sulfide, and other chemicals. Temperatures near the sun were hot enough to melt silicates and other minerals, forming the chondrules found in early meteoroids (dashed black circles). Beyond the “snowline” (dashed white curves), water, methane, and other compounds condensed to ice. Numerous chemical reactions contributed to the isotopic ratios seen in relics of the early solar system today. Beamline 9.0.2, the Chemical Dynamics Beamline, generates intense beams of VUV – vacuum ultraviolet light in the 40 to 165-nanometer wavelength range (a nanometer is a billionth of a meter)– which can be precisely tuned to mimic radiation from the protosun when the solar system was forming. More recently Thiemens’s group used beamline 9.0.2 to perform the first VUV experiments on sulfur, using the results to build a model of chemical evolution in the primitive solar nebula that could yield the isotopic ratios of sulfur seen in meteorites. They report their findings in Proceedings of the National Academy of Sciences ("Sulfur isotopic fractionation in vacuum UV photodissociation of hydrogen sulfide and its potential relevance to meteorite analysis"). Oxygen is the most abundant element on Earth, present in air, water, and rocks; 99.762 percent of it is the isotope oxygen-16, with eight protons and eight neutrons. Oxygen-18 has two additional neutrons and accounts for another two-tenths of a percent; oxygen-17, with one extra neutron, provides the last smidgen, less than four-hundredths of a percent. Sulfur, with four stable isotopes, is less abundant but essential to life. Sulfur-32 accounts for 95.02 percent, sulfur-34 4.21 percent, sulfur-33 0.75 percent, and sulfur-36’s mere 0.02 percent brings up the rear. Changes in temperature and other physical factors can thus produce different isotope ratios – that’s why there’s a greater proportion of oxygen-18 in raindrops than in the clouds they fall from, for example. Isotope-ratio researchers commonly graph these processes by plotting samples with increasing proportions of oxygen-18 relative to oxygen-16 along the Y axis; the X axis shows increasing proportions of oxygen-17 to oxygen-16. When comparing these three isotopes in almost any sample from Earth to an arbitrary standard called SMOW (standard mean ocean water), the proportions of the three always diverge at a rate that can be plotted along a line with a distinctive slope: about one-half. Samples whose isotope ratios don’t fall on the slope-one-half line didn’t result from mass-dependent processes. In 1973 the ratios of oxygen isotopes in carbonaceous meteorites, the oldest objects in the solar system, were found to vary significantly from those on Earth. Their graph line had a slope close to one. A decade later Thiemens and John Heidenreich found that ozone, the three-atom molecule of oxygen, showed a similar isotope trend, with a similar slope of one – a relationship that was at least partly due to the molecule’s chemical formation. Sulfur isotope ratios are plotted in a similar way; the standard is an iron sulfide mineral called Diablo Canyon Troilite – not native to Earth, however, but found in a fragment of the meteorite that created Arizona’s Meteor Crater. Since Thiemens’s early work with ozone 30 years ago, his UC San Diego laboratory has perfected methods of recovering primordial samples from dust, meteorites, and the solar wind. Thiemens and Chakraborty were members of the science team for NASA’s Genesis mission, and Chakraborty was able to extract mere billionths of a gram of oxygen from particles of the solar wind even after the spacecraft’s collectors were badly damaged when they crashed upon return to Earth. Like oxygen, sulfur isotopes show up in different fractions in different solar system sources. Tracing their possible origins, the recent study of sulfur isotopes at beamline 9.0.2 began by flowing hydrogen sulfide gas – the most abundant sulfur-bearing gas in the early solar system – into a pressurized reaction chamber, where the synchrotron beam decomposed the gas and deposited elemental sulfur on “jackets” made of ultraclean aluminum foil. The experiment was performed at four different VUV wavelengths, and the carefully stored aluminum jackets were taken to the Thiemens lab in San Diego, where Chakraborty and Jackson chemically extracted the sulfur and then measured its isotopes using Isotope Ratio Mass Spectrometry. In all samples the isotope compositions were found to be mass independent. One source of fractionation in nature was photodissociation of hydrogen sulfide as the gas condensed to iron sulfide in the inner solar system, driven by intense 121.6-nanometer-wavelength ultraviolet light as the young star repeatedly shook with violent flares and upheavals. Different classes of meteorites – and different parts of the same meteorites, such as their crust or various inclusions – subsequently evolved different isotope ratios, depending on where and when in the solar system they formed. Sulfur compositions evolved independently from the way oxygen isotope compositions evolved. The most recent target of research by the Thiemens group at beamline 9.0.2 is nitrogen, the seventh most abundant element in the solar system. On Earth, 99.63 of nitrogen is nitrogen-14, and nitrogen-15 is the remaining 0.37 percent. Measurements of the solar wind, carbonaceous meteorites, and other sources show wide swings in their proportions. The work is ongoing. The theory known as self-shielding posits that the outer layers of clouds of carbon monoxide (CO), which were abundant when the solar system was forming, would have preferentially absorbed certain wavelengths of the protosun’s ultraviolet radiation, breaking the CO into carbon and oxygen atoms, which were disproportionately oxygen-16. Deeper in the cloud the result would have been an excess of oxygen-17 and oxygen-18, both equally excessive compared to the ratios among the three isotopes found on Earth today. “Processes creating an equal amount of excess in oxygen-17 and oxygen-18, that’s what is required to explain the measurements from primitive materials,” explains UC San Diego’s Subrata Chakraborty. But does self-shielding of CO really provide the required explanation? Self-shielding has been observed in molecular clouds far out in space, but from their beamline 9.0.2 experiments the Thiemens group found that, after photoabsorption, other follow-up photochemical processes were more effective in deciding the final isotope-ratio outcome. And because these processes don’t yield equal excesses of oxygen-17 and oxygen-18, self-shielding can’t resolve the oxygen-isotope puzzle. Oxygen and sulfur are the third and tenth most abundant elements in the solar system and two of the most important for life. Their isotopic differences from Earth’s are clearly seen in many different kinds of meteorites. Thiemens’s team first used beamline 9.0.2 in 2008 to test a theory, called “self-shielding,” about why oxygen-16 is less prevalent in these relics of the primitive solar system than it is in the sun, which contains 99.8 percent of all the mass in the solar system. To their surprise, the experimental results showed that self-shielding could not resolve the oxygen-isotope puzzle.